Banks are going to have to hold more capital as a cushion against losses, under new rules adopted today by the Federal Deposit Insurance Corporation and the Office of the Comptroller of the Currency. The Federal Reserve Board, which developed the rules jointly with the other banking regulators, approved them last week. The new capital rules, intended to make the banking system more resilient and less vulnerable to a catastrophic collapse, will bring the United States in line with international capital standards known as “Basel III” (so called because they’re the third iteration of rules adopted by the Basel Committee on Bank Supervision). The agencies estimate that nearly 90% of smaller banks (those with less than $10 billion in total assets) and almost 95% of larger banks (those with more than $10 billion in assets) already meet the new rules. Indeed, they come at a time when the U.S. banking system is, by some measures, healthier than it’s been in years — though the slowly improving economy is only one reason. Another is that most if not all of the weakest banks have been purged from the system, either through open-market mergers or by FDIC seizures. 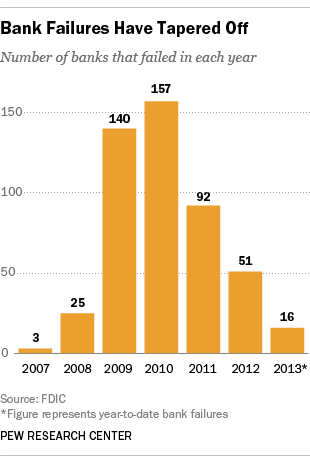 Bank failures have fallen dramatically from the dark days of 2009 and 2010; there were 16 in the first half of this year, down from 31 in the first half of 2012. In addition, banks have raised billions in new capital, either on their own or because regulators leaned on them to do so. And they generally have stricter lending standards than they did before the crisis, though according to the Fed’s quarterly survey of senior loan officers they’ve eased up some in recent years. 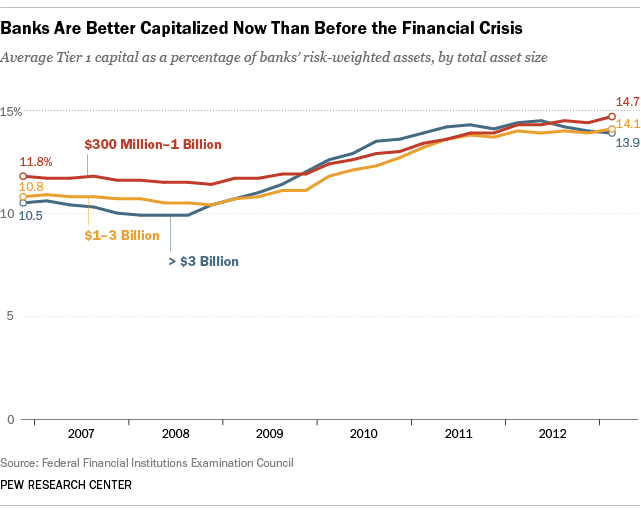 The net result: capital ratios that are well above their pre-crisis levels. The chart below shows one key metric, the “Tier 1 risk-based capital ratio,” as an average for banks in different size ranges. The rules impose a new requirement on banks to hold “common equity Tier 1 capital” — mostly money paid in by common stockholders plus retained earnings — equal to 4.5% of their assets, with the latter weighted by their risk of default. Banks also will have to hold an additional 2.5% as a “capital conservation buffer” — essentially as a first line of defense for periods of financial stress — or face restrictions on paying out dividends to shareholders and bonuses to executives. Other regulatory capital ratios will be raised. Despite the banking industry’s overall improvement, many bankers had argued against the new capital requirements, saying they could make loans costlier or harder to come by, especially for small businesses, and cut into job growth. Some also said the cost of complying with the rules could force even more smaller, rural banks to merge.